Scattered showers and thunderstorms threaten the tri-state area once again Monday, a day after torrential downpours caused dangerous flooding in parts of the region, according to Storm Team 4. A flash flood watch is in effect for central and western New Jersey until 11 p.m. Monday; the storms are not expected to be as bad as those that pummeled the state Sunday, but with the ground already saturated, any additional rain increases the threat of flooding, according to Storm Team 4. Sussex, Warren, Morris, Somerset, Hunterdon,Middlesex and Monmouth counties are all under the flood watch. The chance for thunderstorms persists Monday evening and into the later hours, particularly north and west of the city. Much of New Jersey was under a flash flood watch on Monday just hours after waters receded from weekend flooding. Tracie Strahan reports. Meanwhile, the floodwaters from Sunday's storms have barely receded. At Colfax Road and Hamburg Turnpike on Sunday evening, the water was about waist-deep. That was the story throughout several parts of New Jersey over the previous 24 hours. Emergency crews conducted several water rescues in Wayne and streets there were shut down Sunday night because of floodwaters. 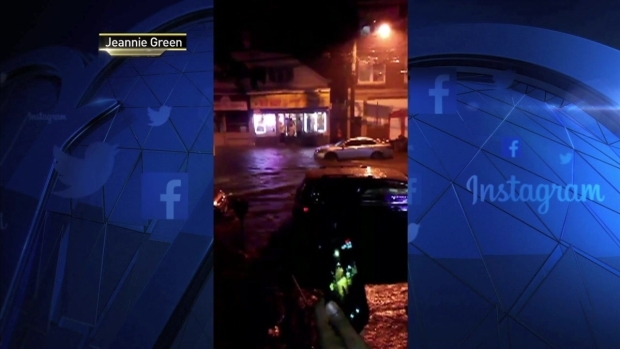 There was also flooding in Flemington and in Paterson, where people reported having to wade through waist-deep water on Union Avenue. In Morristown, trees fell and streets were closed as storms lashed the area. Less rain is in the forecast for Tuesday, and Wednesday is expected to be mostly sunny and warm. Temperatures on Monday are expected to reach a high of 82 in the city, with temperatures steadily increasing over the course of the week. This weekend, the highs will reach the high 80s or low 90s, Storm Team 4 says.